Local Suicide are turning 5! The German/Greek power-duo are ditching their baby teeth and celebrating half a decade of blog-running, mischief and travelling round the world playing in such locations as New York, Tunisia, Tel Aviv, Bangkok, Saigon, Istanbul and Barcelona, this saturday at Cosmic Kaspar. Behind the decks we find Go Bang! resident Franz Underwear, Eskimo Twins’ Heretik and of course the birthday boy and girl. 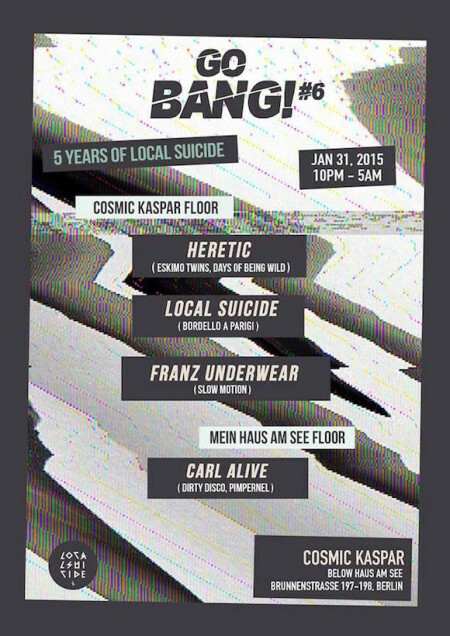 Carl Alive from Munich’s Pimpernel club will be holding the fort upstairs in Mein Haus Am See. Join the fun HERE. The pair recently abandoned the “comfort” of Berlin for the great white plains of Lapland during their recent expedition to Lapp Dance. The event, a Nordic By Nature venture which sought to promote Berlin music and culture, took place at The Crazy Reindeer hotel in Levi , Finland, and also saw performances by Kid Simius, Ada, The/Das and Molly Nilsson. Read more about the festival on Spex and Groove.